Cube Book it is part of the series Diary that is a reflection of changes in my life. The book has the potential of being a cube, and because every one of the sides doesn’t have adhesion, the book can be displayed in different forms. 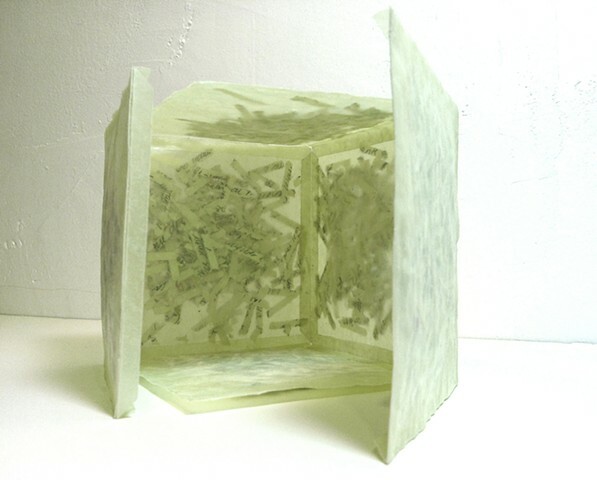 This artist book is made with memories that I wrote and shred in small pieces and put inside squared envelopes of translucent paper which they form each page or side of the cube. These pieces of paper within the envelopes are not fixed, shifting freely with movement, creating ephemeral and new images that represented the changing present.